It's that time of year again! Time for the Tissue Box Challenge with JDaniel4sMom, just in time for Earth Day. She was sweet enough to ask me to be one of the judges this year, so I won't be participating in the contest, but I still wanted to make something because the boys love our tissue box creations (like last year's rocket ship). 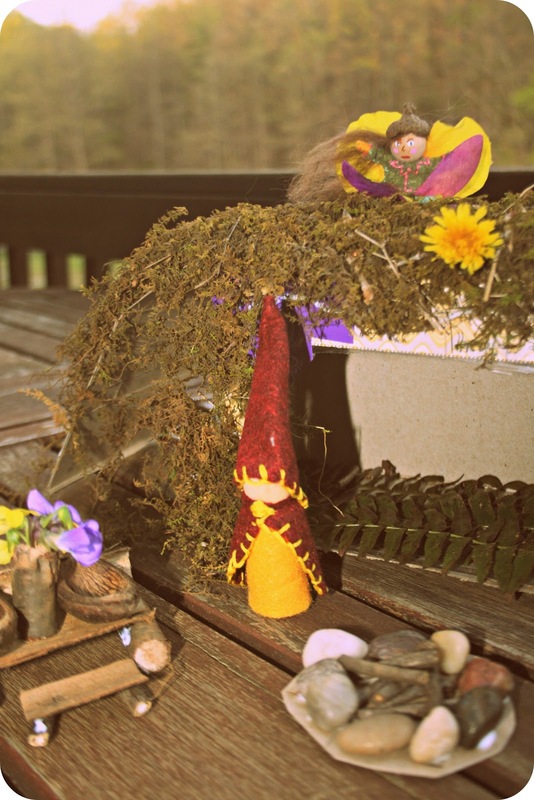 I made some gnomes and fairies back when I had vertigo, and I thought it would be fun to create an earthy house for them. I hope that gnomes and fairies can coexist and don't get into fights. I started by cutting up a small tissue box to add to a large tissue box, using duct tape. I made little chairs and a table from sticks and bark. Acorn shells make perfect little bowls. And Paul helped me drill a hole in a thick stick to make a vase for the forest wildflowers. See the flower fairy on top? I thought she turned out cute. Reid is always my most enthusiastic child when it comes to tissue box crafts. He can never wait for the glue to dry before he starts playing. Want to take on this creative challenge? Just click on the button on my sidebar - it lasts until April 22nd. 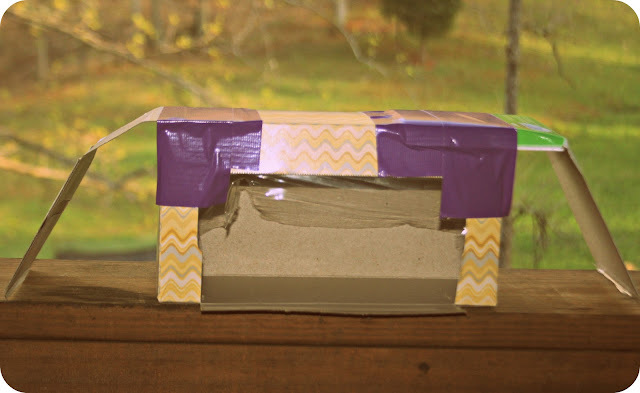 All you have to do is make a fun kid craft from a tissue box, blog about it, and link up. There are fun prizes as well. Readers, do you think that gnomes and fairies can get along, or do they need separate habitats? That is so cute! Ever thought of making them to sell? How adorable! I have a friend from Iowa who enters fairy house creation contests. Some of them are extremely elaborate! I don't think gnomes get along with anybody. They are grouchy, you know. This is absolutely wonderful. I think there just may have to be a judges prize! So many people are doing fairy gardens etc.... so you fit right in. I was trying to think of something to do to enter the tissue box challenge. I SO used to do this when i was a kid. Thank you for reminding me. I went a little bonks for making little worlds . . Sometimes I would create a little world inside the box - cover it with tissue paper and put a hole in one end . . like a peek show into paradise . . .
That is so cute and creative! I never would have thought to do that with a tissue box. Great job! You are so creative. I have always been fascinated with the little garden fairy house I see on pinterest. 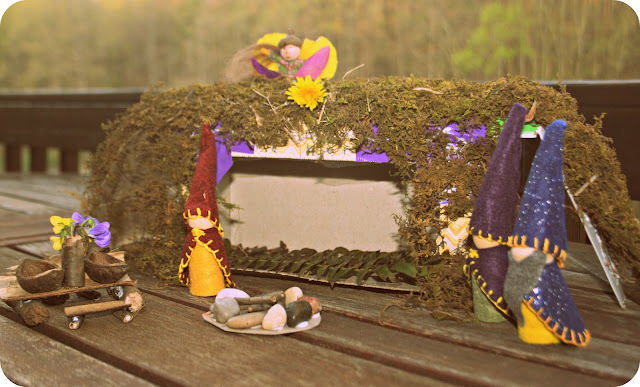 I think its great your boys can play with the little fairy house. 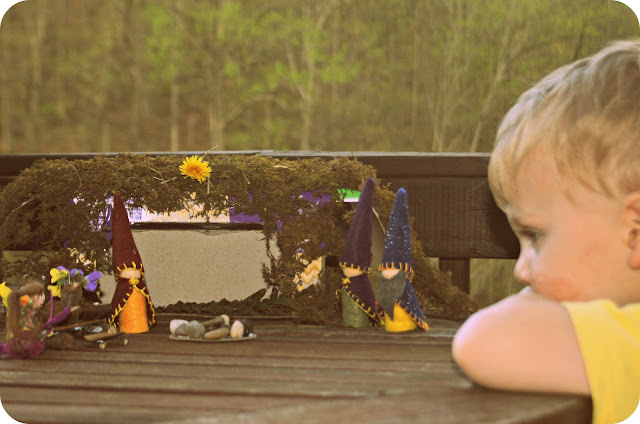 I know my grandson would love to play with the little gnomes. You really are clever! I love how you take what you have and come up with these magical masterpieces! Great job Lisa!! Is the vertigo any better for you? Having that sure isn't for sissies! You're so clever and creative! You built a little world. I would definitely be playing with it if it was in my house! :-) I do believe that fairies and gnomes can get along. This is absolutely adorable!!! And you paid so much attention to details! That is SO CUTE and creative! When I was little, I used to watch Captain Kangaroo make all kinds of neat stuff from shoe boxes and construction paper. You are probably not old enough to remember him but it was a neat show. You could easily take his place! Awwwww, just look at that magical little dwelling! So cute! I love the little figures, too! That's so sweet. I bet they had fun making that with you. I love this! A wonderful item for imaginative play.